Over 35% more logs than our competitors large crates – it’s important to understand other suppliers have reduced the width or height of their large crates this year in an effort to appear cheaper. The crate contains the equivalent of approximately 4 builders bags of logs, or 2.7m3 (cubic metres) of loose logs – this figure is based on multiplying the internal stacked volume of the logs with a multiplier of 1.7 – the industry standard for calculating the loose volume of logs from a stacked load. This is the main benefit of buying our stacked crates. Note: Click here to see what the crate looks like when emptied loose into cages, demonstrating the huge difference between stacked and loose volumes. 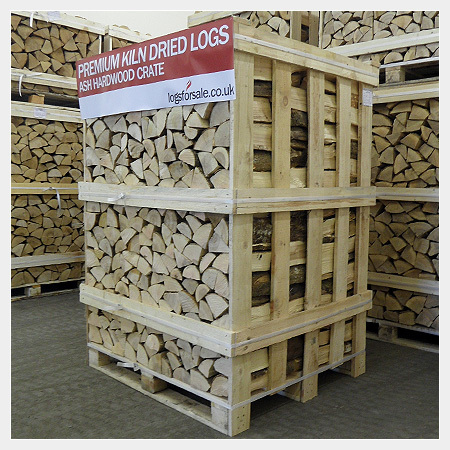 We recommend the full crate for intensive use of wood burners throughout winter – one should last you the entire season. If you will be emptying the crate and need somewhere to store your logs, we also recommend purchasing 2 of our small log stores – these will hold the volume of logs in our extra large crate. Important Delivery Information: Delivery is performed by a nationwide pallet courier using a large tail-lift vehicle and pallet trolley. Please read our delivery section to ensure you fully understand the limitations before placing your order.